This was published as a Wall Street Journal Think Tank column on November 15, 2014. October Kaiser Family Foundation polling on uninsured Americans. Ahead of the Affordable Care Act open-enrollment period beginning Saturday, the Obama administration announced its projections for enrollment in the ACA marketplaces. By its forecasts, 9.1 million to 9.9 million people would enroll, fewer than the 13 million projected by the Congressional Budget Office in its budget forecast. There are 7.1 million people enrolled now. The questions that arose this week: Is one number right or wrong? Was the administration lowering expectations? The best answer here, simply put, is that there is no right number, that one estimate is as good as the other, and that enrollment is very hard to predict. One reason it’s difficult to project is that the open-enrollment season is only three months, or half as long as it was last time. We don’t know how the uninsured will react to the shorter window. Many of the remaining uninsured have been without insurance for years or have never had it, or they are not online. For many reasons, they will be a harder group to reach. On the other side of the equation, more insurers are offering plans in the marketplaces and reaching out to consumers, things that could help boost enrollment somewhat. But the big reason we can’t estimate enrollment with any certainty is that the uninsured go into this second open-enrollment season wanting coverage but with such low levels of knowledge that open enrollment is even happening that it is hard to predict how many will enroll in any given year. 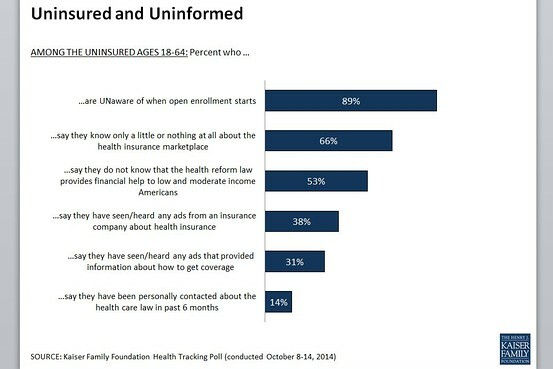 As the chart above shows, as of mid-October nine out of 10 uninsured Americans were unaware that open enrollment is beginning. About half were aware that they could get financial assistance to help pay their premiums, and less than 15% have been contacted by someone about the law in the past six months. Preliminary data from Kaiser Family Foundation polling this month suggests that awareness has not changed much since October. There is no question that the uninsured want coverage and that these low levels of awareness may well change a lot as the enrollment process gets rolling and more of the uninsured focus on the availability of new coverage options. Interest in enrolling may be triggered by outreach, the availability of tax credits to help subsidize premiums, the penalties uninsured Americans will have to pay if they do not buy insurance (fines that increase substantially this year), or some combination of all these. Ultimately, ACA implementation is fluid and evolving; it’s a multiyear process. Forecasting specific annual enrollment targets is, at best, a dismal science.